A huge purchase of banking shares in the final minutes of the February 27 session on the local stock exchanges drove shares up, after a brief fall at the beginning of the session. The benchmark VN-Index on the HCM Stock Exchange (HOSE) advanced slightly at 0.46 percent to close at 1,119.61 points on February 27. It had gained 1.06 percent to settle at 1,114.53 points on the previous day. 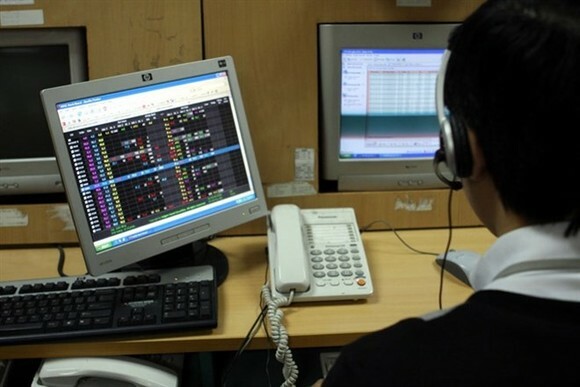 The HNX Index on the Hanoi Stock Exchange (HNX) edged up 0.88 percent to end at 127.29 points. The index had dropped 0.06 points to end at 126.18 points on February 26. The UPCOM Index on the Unlisted Public Company Market rose 0.55 percent to stand at 60.07 points. It had inched 0.31 percent to finish at 59.74 points on February 26. More than 268.9 million shares, worth 7.6 trillion VND (334 million USD), were traded on February 27. However, the market trading condition was ruled by declining stocks, which were dominant over gainers by 364 to 294, while 801 other stocks ended flat. Large-cap stocks also had a good trading day as 18 of the 30 largest shares by market capitalisation advanced in the VN30 Index. They had more positive movement than the overall market, driven by VCB, MSN and MWG. The VN30 Index was up 0.58 percent to 1,106.09 points with more than 81.1 million shares exchanged, worth 4.02 trillion VND. Foreign investors were net seller of 196.50 billion VND on HOSE, focusing on VJC (45.4 billion VND), DIG (20.7 billion VND) and BID (16.2 billion VND). In addition, they sold a net of 11.01 billion VND on the HNX. Bank stocks rallied across the board as only Lien Viet Post Joint Stock Commercial Bank (LPB) slid and others jumped such as Bank for Foreign Trade of Vietnam (VCB), rising 1.8 percent, Vietnam Joint Stock Commercial Bank for Industry and Trade (CTG), climbing 4.6 percent, and Asia Commercial Bank (ACB), moving up 2.4 percent. Oil-gas stocks continued to climb, typically PetroVietnam Gas Joint Stock Corporation (GAS), PetroVietnam Technical Services Corporation (PVS), PetroVietnam Drilling & Well Services Corporation (PVD) and PetroVietnam Coating JSC (PVB) thanks to the rise in oil prices. Investors should remain cautious as selling pressure may return in the high price range in the next few sessions, Bao Viet Securities Company (BVSC) said in its daily report. “Large-cap stocks may continue to support the two indices in the next sessions. However, the market is likely to experience a wide divergence with rising selling pressure in mid-cap and penny stocks,” BVSC said.